Do nothing and continue to suffer the stigma. Stand up for ourselves and take action whenever we can. There are many opportunities to fight the stigma that are quick and simple and can be acted upon even when we're ill and haven't the strength to do much. The stigma associated with Migraine, Cluster Headaches, and other Headache Disorders increases the burden of living with them. However you phrase it, whatever words you use, it needs to be understood and fought! Oh, no, she didn't just say that about Migraines! Have you ever had a friend say something to you about your Migraines or headaches that left you wondering how anyone could be so ignorant or so hurtful? A while back, an old friend I hadn't heard from for ages called to ask me a question. She asked how I was, and I replied, "Other than a raging Migraine, I'm fine, thanks." She said to me, "Take three extra-strength Tylenol with a cup of coffee. That will fix you right up." I sadly replied, "Thanks for the suggestion. Unfortunately Tylenol doesn't touch these Migraines." Now this is someone I've known since high school. She's seen me crouched on the school restroom floor by the toilet, vomiting over and over again. Yet her reply to me then was, "If you won't try Tylenol for that Migraine, stop complaining." I was stunned. You may find it hard to believe, but I was actually speechless! After a short silence, I told her she should call someone else with her question, then hung up the phone. Then I sat here and cried. Now that some time has passed, I've written a letter to her. Thinking that other Migraineurs have shared similar experiences, I changed her name and published the letter as a blog post, thinking that other people who have encountered similar situations might be able to share it with people in their lives who need to get a clue. Alice, you recently said to me, "Take three extra-strength Tylenol with a cup of coffee. That will fix you right up." When I said, "Thanks for the suggestion. Unfortunately Tylenol doesn't touch these Migraines," your reply was, "If You Won’t Try Tylenol for That Migraine, Stop Complaining." I was so astounded, dismayed, and aghast, that I couldn't speak. I was also hurt and, quite bluntly, offended by your statement and attitude. That's why I told you I'd talk with you later and hung up. Now that I've had some time to recover, I'm writing a response to you. If you think it would be helpful to share that blog post with others, please do so. There are buttons at the top and bottom to allow you to easily post it to social media sites and a button to let you print it simply. © Teri Robert, 2014. All rights reserved. This week for ACHE Tuesday - a look at learning more about the stigma associated with Migraine and how we can work to stamp it out. Undoubtedly, the stigma associated with Migraine disease makes it more difficult to live with Migraines. there is more stigma associated with Migraine than with epilepsy. Please take a few minutes to continue reading Learning About and Reducing the Stigma of Migraine. 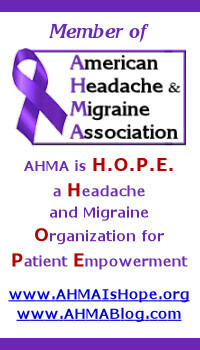 Welcome to 2013 Migraine & Headache Awareness Month! Migraine & Headache Awareness Month (MHAM) is observed each June in the United States. The goal of MHAM is to build awareness, educate the public and reduce the profound stigma associated with Migraine, Cluster Headaches and other Headache Disorders. Migraine & Headache Disorders are prevalent, costly and burdensome. And people living with Migraine deal with a great deal of stigma. The theme of MHAM for 2013 is Unmasking the Mystery of Chronic Headache Disorders. This is an especially appropriate choice given how little most people know about the features and symptoms of Migraine and other Headache Disorders. But as patients we can help lift the mask of misunderstanding. Helping our loved ones understand what we live with and the role of Migraine and Headache Disorders in our lives can improve our relationships and reduce stigma. Participating in MHAM-related events is a great way to help your family and friends learn what these conditions are and how we're affected by them. Options for helping create awareness this month include activities like a blog challenge, printable fact sheets, a photo a day challenge, and much more. Little things like proudly wearing purple to promote Migraine & Headache Disorders awareness are also highly encouraged. Every little act adds up. If you've considering joining in and doing the Blog Challenge, Photo Challenge or some other daily online event, please know there's no pressure to do every single day. Just do what you can and want to. AHMA exists to EASE the burden of Migraine and other Headache Disorders through Education, Awareness, Support, and Engagement. One of the best things about the Internet is all of the wonderful blogs written by people who have Migraine and other headache disorders. Last week, I came across an entry that so clearly and succinctly expressed the frustration that the stigma associated with Migraine disease causes us that I wanted the whole world to read it. The entry was written by Dawn Harris, who is living with chronic Migraine. Dawn says, "Living with Migraine is a DAILY battle, but my life is not defined by the losses. It is about all the moments that we capture in between." Brava, Dawn! With Dawn's permission, here is her blog entry, entitled I Am No Longer Using the Word "Migraine:"
While trying to yet again explain that migraine is more than a headache, I came to a conclusion. We really need to rename this disease. Rather than trying to continually educate the public and dispel the myth about migraine, we simply need a new medical name for this nervous system disease currently known as migraine. I think I will start telling people I have a severe nervous system disorder. Or use the definition as my answer. "I have a genetic neurological disease." That seems like a more realistic answer anyway. It is not just a headache. In fact, most of the time it is not even ABOUT the headache pain. It is about the daily struggle to function. It is the constant reality that everything I do WILL cost me something and the balancing of is this worth the cost. It is about making choices and sometimes having that ability stolen from me altogether. It is about always being aware of everything around me; sights, sounds, smells, temperature fluctuations, weather fronts...the list goes on and on and on. It is about all of the other physical side effects; nausea, vertigo, sensitivity to light, sound and smell, food sensitivities, muscle stiffness and pain, vomiting, slurred speech, inability to come up with words or to even talk at all. Confusion, depression, insomnia, overly sensitive to touch. Feeling like a failure. This list also goes on and on... and that is all without even mentioning the "headache phase" that most people associate with migraine. This is a DAILY battle. Even on "good" days, whatever those are. My definition of good has dwindled over the years. I'm not even sure what a good day looks like anymore. It all just blurs together. Good should be more than just a day the pain didn't send me back to bed, but unfortunately that seems to be the definition lately. No, I don't think "Migraine" captures the true nature of this beast. So until they have a new name for the disease formerly known as migraine, I am sticking with genetic neurological disease. Originally published on her blog, Nervous System Overload. Migraine and Stigma podcast, part 1, related to the article above.